Google Panda has once again been a popular subject lately, as many site owners have been taking a good look at quality issues on their sites, especially with Google Fred also bringing up unrelated (Fred is not related to Panda) quality issues on sites as well. Gary Illyes was answering Google Panda questions on Twitter recently, and after commenting on whether a site move would fix Panda issues or not, he was asked about whether moving them to a subdomain would help. Google has always advocated improving poor quality content over removing it, or at least noindexing it while the content is being improved. But moving it off to a subdomain where it won’t impact the main part of the site is an interesting way to do it, although there are certainly some caveats. First, there is a redirection issue – first by moving them to the subdomain and then moving them back again. And because low quality pages tend to be crawled much less, it could be quite some time before Google does see the redirects, or the content when it is improved. This is why most site owners tend to either remove the poor quality content and not fix it, or noindex it until it can be fixed. It is also important to note that he stresses the “may” part of his sentence – so it may not be an easy fix in all, or even many, cases. So definitely use this advice with caution. Illyes also adds it is important to think about content from a user perspective, instead of strictly from an SEO / Google perspective. This is something that Google stressed in their comments in the Google Panda algo guide. 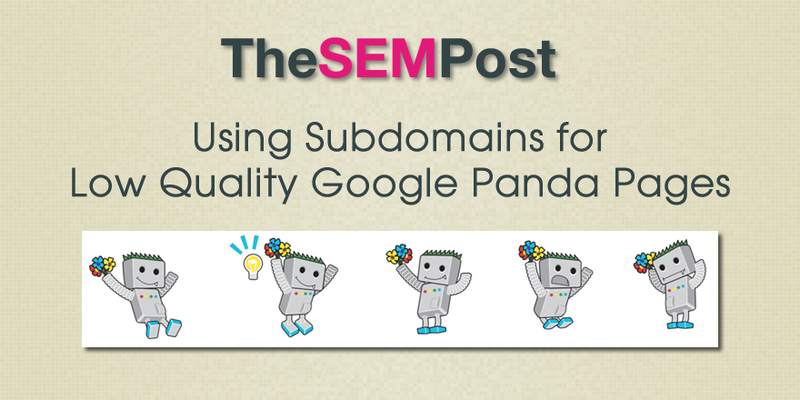 But if you are looking for a way to help fix Panda issues without using noindex on the main site while you improve content, a subdomain could be an option to do it.